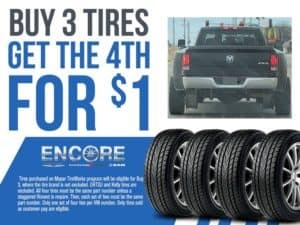 Tires purchased on Mopar TireWorks program will be eligible for Buy 2, where the tire brand is not excluded. OHTSU and Kelly tires are excluded. All four tires must be the same part number unless a staggered fitment is require. Then each set of two must be the same part number. Only one set of four tires per VIN number. 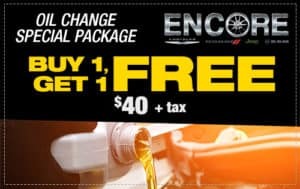 Only tires sold as customer pay are eligible. Plus tax. Up to 5 qts. of conventional oil and filter, labor included. 1 year expiration from purchase date.